Anthony is one of Retail Fabricators, and he operates and maintains our Bottero Straight Edge polishing machine. Anthony joined the team in April of 2016 after being referred to us by our partner, Snelling Staffing Service. Anthony came to us with glass experience, and we knew almost right away that he was a good fit for the Quality Glass & Mirror team. Anthony always come to work on time, ready to give his best. He is constantly moving, and we love that he always has a smile on his face! 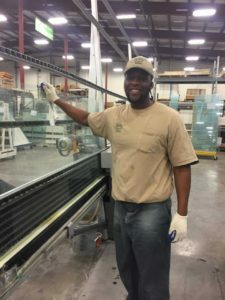 “Quality Glass is fortunate to have Anthony on our team,” said Kevin. Thank you for all you do Anthony – you are an important part of What Makes Us Work!